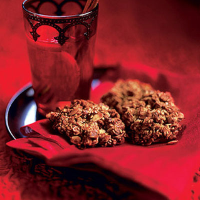 I love oatmeal cookies and have fond memories of my mother baking them with plenty of cinnamon. Her recipe calls for lots of sugar, vegetable shortening and flour. This is a slightly lighter version but just as delicious. The honey, lemon and cinnamon combination is rather hot toddy-like, so you could serve these with a clove-perfumed hot whisky, next to the fire. Preheat the oven to 180°C, gas mark 4. Line a baking sheet with baking parchment. Put the butter, salt, honey, cinnamon and lemon zest in a saucepan and heat gently until the butter has melted. Stir in the oats and seeds until evenly coated. Drop dessertspoonfuls of the mixture on to the baking sheet, leaving space for spreading between each cookie. Neaten the edges of each. Bake for 10-15 minutes or until golden in the centre and starting to brown at the edges. Cool for 10 minutes before removing from the paper, then leave to cool completely on a wire rack before serving.